I spent some time in New York City last week. I attended another Vogue Knitting Live event which was as amazing as I expected. Before the event, however, I was able to do a couple other NYC activities. New York City Winter Restaurant Week runs from January 21 through February 8. During this nearly three week event, 380 various restaurants offer special menus for special prices for lunch and dinner. A two-course lunch is $26, while a three-course dinner is $42. My daughter and I were able to dine at two restaurants that would normally be way out of our budget for prices only a little higher than we would usually look for. A deal for dining in NYC! The most interesting activity that my daughter and I did, though, was visit the 9/11 Memorial and Museum. We had tried to visit the last time we were in NYC, but the weather was terribly cold. This time it was warmer, but pouring rain. We knew we could visit the museum despite the rain and hoped the rain would stop before we came back outside. (It did). Although it was wet and dreary, we were able to view the memorial. 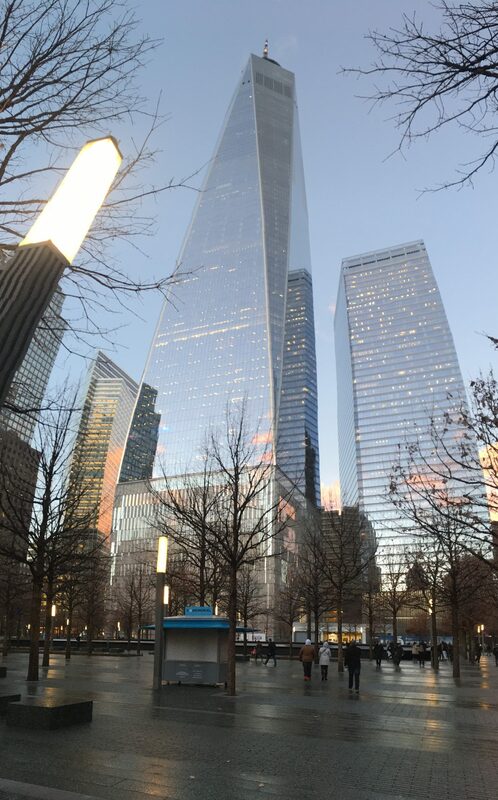 We took the #3 subway line from our hotel in Times Square to the World Trade Center stop near Cortland Street. We exited the subway into the Oculus, a shopping and dining center of nearly 80,000 square feet. 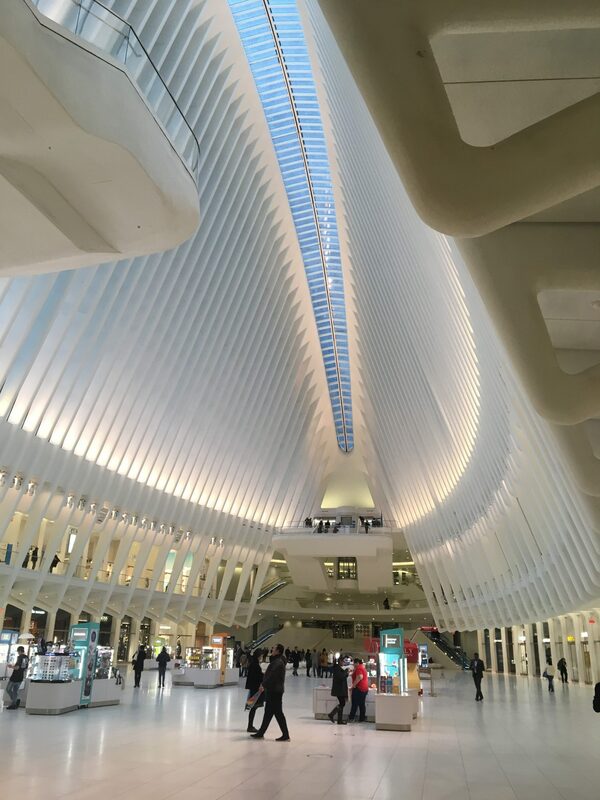 Designed by architect Santiago Calatrava, the Oculus and attached transportation hub is the third largest in NYC, serving over 250,000 people per day. As we exited the Oculus, we found ourselves across the street from the Memorial Plaza. We later realized we could have actually exited right onto the plaza by using a different exit. It was raining, so we quickly made our way to the museum entrance. There are several ticket options for the museum. A ticket to the museum only is $26. If you’d like a guided tour of the Memorial or the Museum, add an additional $15 or $20 (respectively). In addition, an audio-guide can be rented for $8. Discounts are given for certain groups. My daughter and I opted for the $26 admission ticket with no additional tours or guides. We were told that the audio guide was not worth the price because it did not contain any information beyond what was written on the placards near each exhibit. The main exhibits are located on the lower level. September 11, 2001 is a three part exhibit that includes a timeline of the events of the day, a detailing of what led up to the attack, and what happened immediately after. I thought the timeline was the most interesting part of the exhibit. The timeline detailed the days’s events by the minute. The displays included videos, pictures, paraphernalia, and pieces of equipment. 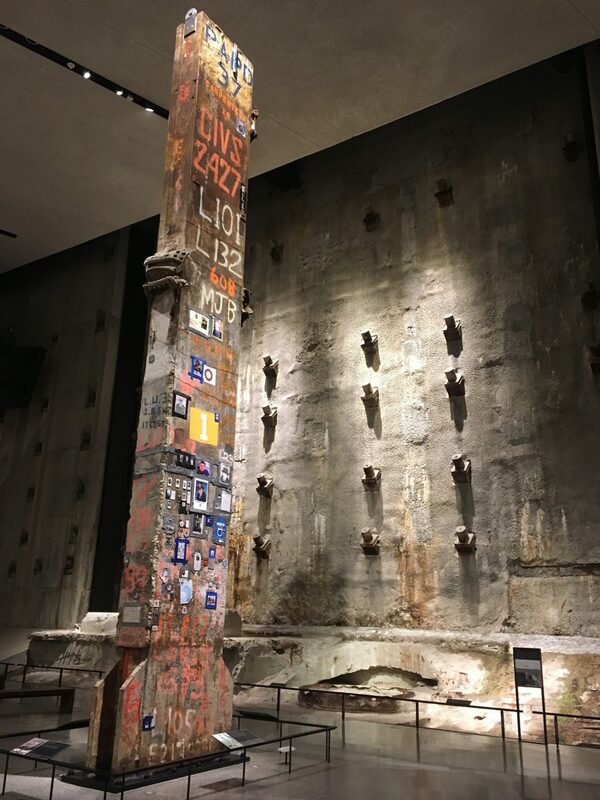 Other displays throughout the museum included In Memoriam – a place where visitors could learn about each person that was killed in the tragedy, the South Tower Excavation, and Rebirth at Ground Zero – building the memorial and rebuilding the World Trade Center. 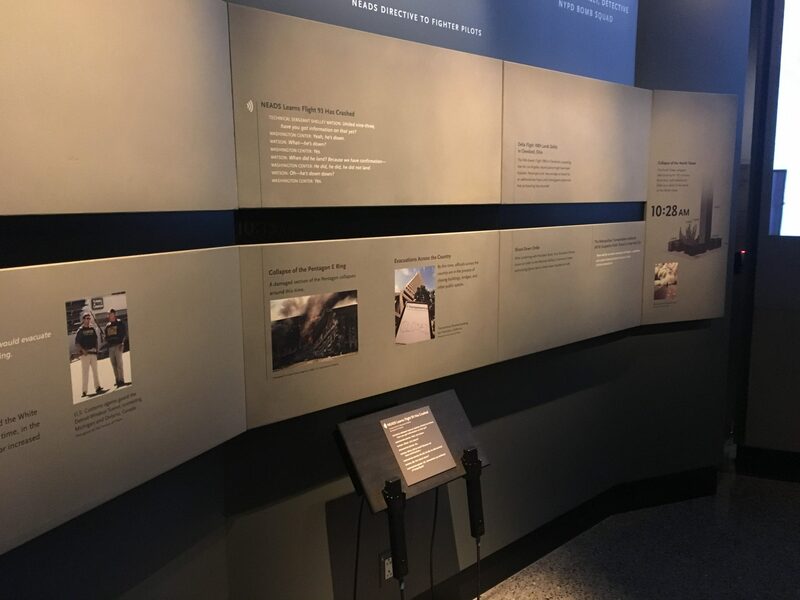 There is a special exhibition space which, at the time we were there, was filled with “Comeback Season: Sports After 9/11.” This exhibit showed how victims and survivors were honored in various sports contests after the event. If you were old enough to remember the tragedy and news coverage, plan to spend most of a day at the museum. My daughter and I spent over 6 hours in the museum – there was so much to see. We could have spent even more time but we wanted to make sure to get out in daylight so we could take pictures of the memorial. Children who were not alive at the time, may not be impacted as much and might not be able to digest all the details. I would still suggest a visit, but I would limit the visit to just one section of the museum at a time. In the place where the World Trade Center’s Twin Towers once stood, there is now a hole in the ground. Water flows from the edges into the hole, at the center of which is an even deeper hole. The bottom of the center hole is not visible giving the impression of a black hole – a place that envelopes all in its path. 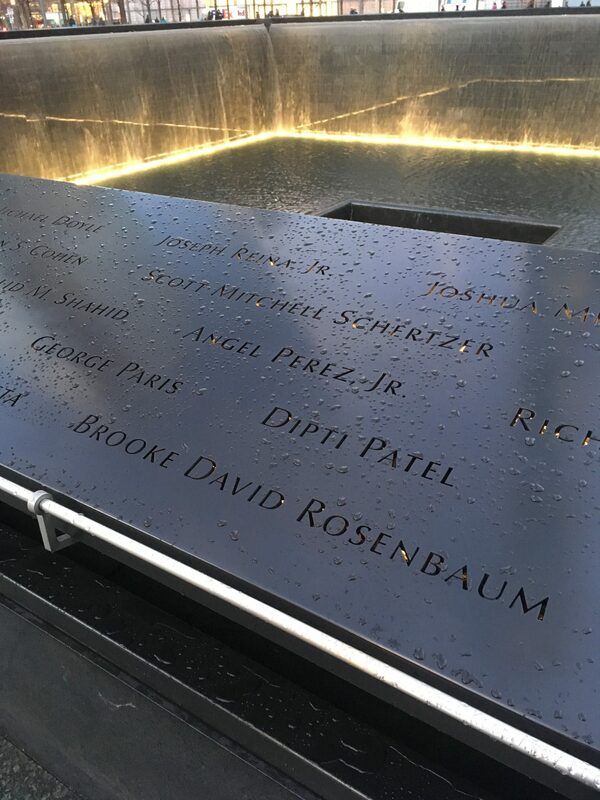 At the edges of the holes are large bronze panels bearing the names of everyone that died in the collapse of the towers. Surrounding these two large holes, however, are green spaces and swamp oak trees. These oak trees, gathered from near the three areas affected (NYC, Washington, DC, and Pennsylvania), were selected because of their durability and leaf color. They each grow differently, emphasizing that they are symbols of living beings. 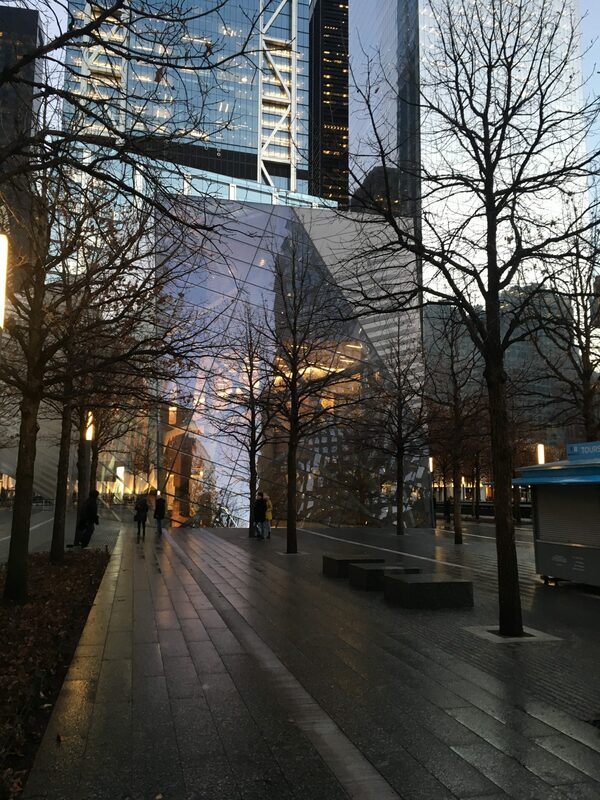 If you are in New York City, I would encourage you to visit the 9/11 Memorial and Museum. I found it a very moving experience, but also interesting and informative. It was well worth the time and money we spent. 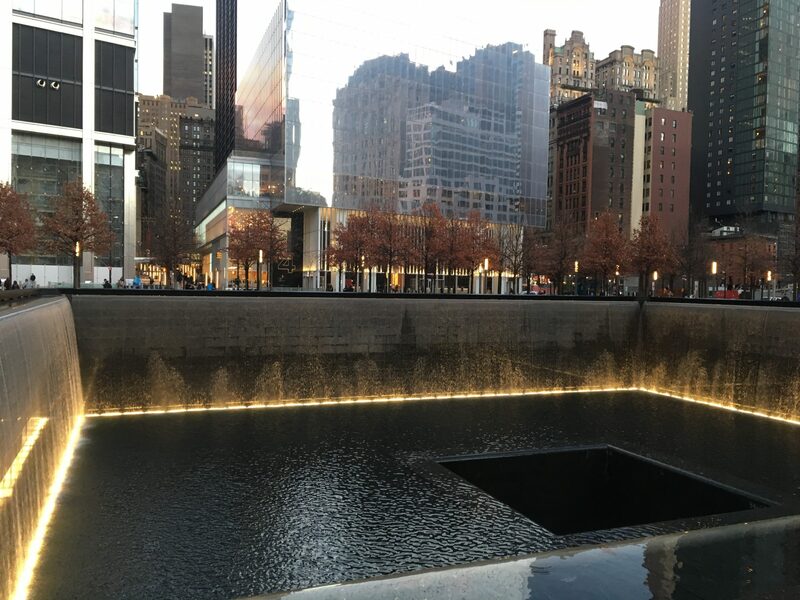 Have you been to the 9/11 Memorial or Museum? Leave your comments below. 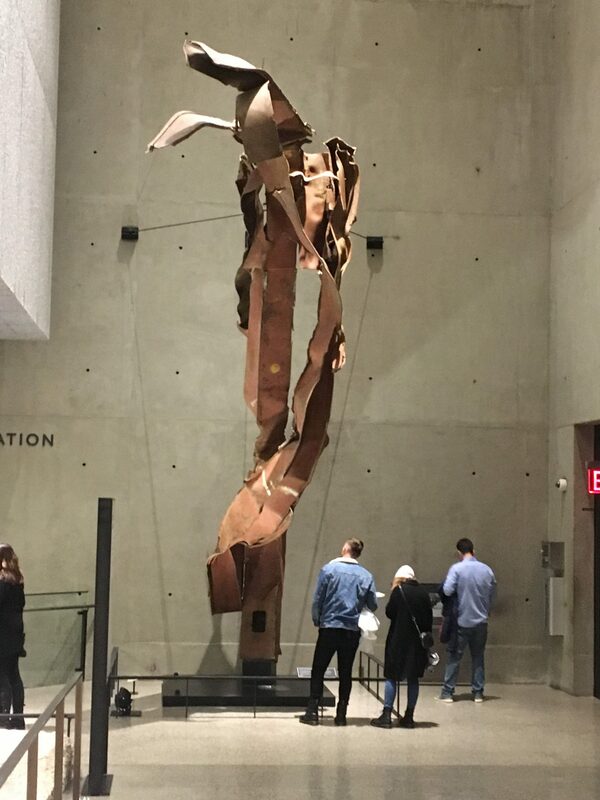 I also found the 9/11 Museum and Memorial to be a very moving experience. It was harder than I thought it would be to listen to and watch some of the audio and video from that day, causing me to relive the tragedy. It’s all a very fitting tribute to those who lost their lives that day, and to their families. Thanks for sharing.